by the Nazis between 1933 and 1945.
places of residence of the victims of the Nazis. 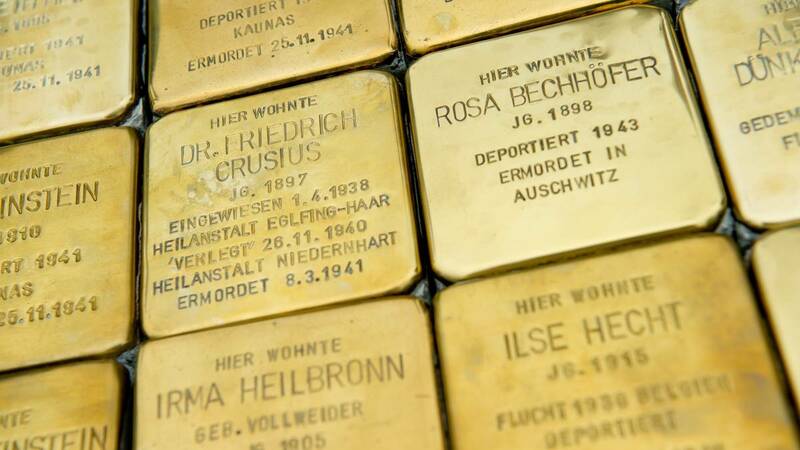 Their names and fate are engraved into a brass plate on the top of each Stolperstein. project itself on this website, being the common platform of all Berlin Stolpersteine-groups. "euthanasia" murders, homosexuals, Jehovahs Witnesses and for people who were persecuted for being declared to be „asocial“. Stolpersteine (stumbling stones) is a project of the artist Günter Demnig. The project commemorates people who were persecuted by the Nazis between 1933 and 1945. Stolpersteine are concrete blocks measuring 10x10cm which are laid into the pavement in front of the last voluntarily chosen places of residence of the victims of the Nazis. Generally, the stumbling blocks are posed in front of the building where the victims had their last self chosen residence. They remember the fate of the victims of Nazi Germany being murdered, deported, exiled or driven to suicide. Their names and fate are engraved into a brass plate on the top of each Stolperstein. In Berlin, Stolpersteine exist since 1996. You can find information connected to the Stolpersteine in Berlin and more about the project itself on this website, being the common platform of all Berlin Stolpersteine-groups. Around 320 Stolpersteine are currently installed in Prague. In the Autumn of 2019 it is hoped Gunter Demnig will install a further 40 Stolpersteine in Prague, 10 in České Budějovice and 8 stones in Jičín. Other stones are planned to be realized in Prague in 2020. Today, Stolpersteine are being realized for Jews, Sinti and Roma, people from the political or religious resistance, victims of the “euthanasia” murders, homosexuals, Jehovahs Witnesses and for people who were persecuted for being declared to be „asocial“.